This award recognizes excellence in commercial building management on the local level. The entry process begins in January; awards are presented at the June 2020 Commercial Celebration Awards dinner. 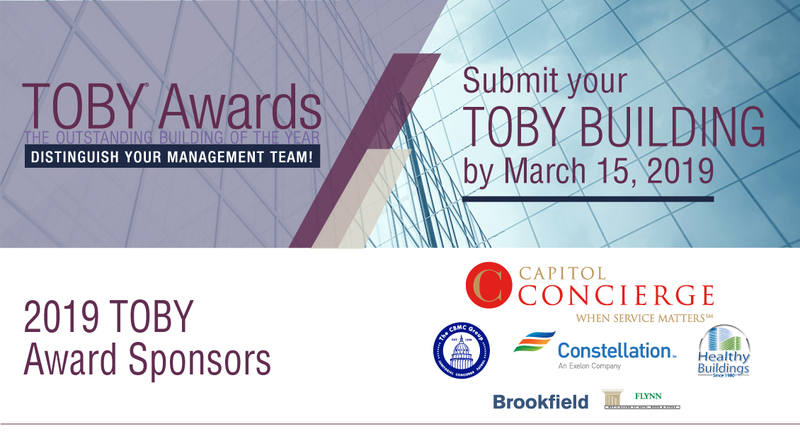 Now in its 35th year, The Outstanding Building of the Year (TOBY®) Awards remains the most prestigious and comprehensive program of its kind in the commercial real estate industry! The competition consists of three levels and begins at the BOMA local association level. The Awards recognize and reward excellence in office building management. TOBY: What's In It for Me? What's Involved in the Award Process and Timeline? The competition consists of three levels of judging. Onsite building judging will take place during the first week of May 2019. Building category winners remain confidential until the AOBA-Metro's Commercial Awards held on June 13, 2019 at the Fairmont Hotel. The winning local entrants advances to the following year's 2020 MAC Regional level competition. These regional winners then advance to the international level where they are recognized at BOMA's 2019 International Conference & Expo, held in June each year. 2019 TOBY Committee Members: Kathryn Clement JBG Smith (2019 Chair), Simon Bustow Boston Properties, Katrina James Brookfield, Diane Peters JLL, Glenn Hugo MRP Realty, Pam Anderson Freddie Mac, Lynda Ellis Capitol Concierge, Brad Braun Transwestern, April Mandell Akridge, Lesley Morrison JBG Commercial, Trisha Graefe Bernstein Management Corp., Elena Paquette Brookfield, & Casie Cutlip Brookfield. · It feels great to win! Going up on stage with your team in front of a crowd of DC commercial management VIPs is a special moment. Displaying the trophy is a great way to feel special and recognized. · The Grand local winning team gets a prize in addition to their building trophy! This is for the building that has the highest score among all categories. · It is an opportunity to distinguish yourself among your peers within and your organization and in the industry. A TOBY award is a great addition to your resume and Linkedin profile. · Gets you out of your office and reminds you about how rewarding and exciting commercial management can be. · Your team bonds through the process, leading to working more efficiently and effectively together. · Gain an in-depth understanding of your building. Teams can incorporate comments from the judges to help improve the building and operations. This helps you manage your building more effectively and enhance tenant satisfaction. · Different team members can gain an understanding of different skill sets, e.g. the engineers can see what PMs are thinking about day to day. · Regional process: written description of building systems becomes a reference point for a variety of uses. · For properties that are not BOMA 360 certified, TOBY-award winning buildings have an opportunity to receive the certification by submitting only a few minor requirements. Yet another opportunity to distinguish yourselves among your peers. · Enhances leasing/marketing of the property. Tenants want to be in a building that is well-managed and feel like they are getting value for their operating expense pro rata share. · It effectively becomes an audit of your property’s management services. Judged by a third-party, the results are unbiased. · The TOBY process is an opportunity to give the building a fresh look by painting common areas and addressing minor repairs that are needed. · Teams can incorporate comments from the judges to help improve the building and operations. · Regional process: written description of building systems becomes a reference point for a variety of uses – leasing packages, appraisals, insurance inspections, etc. · Enhances your marketing package for third-party management and building owner transitions. It is an opportunity to distinguish your company among others. · Teams can incorporate comments from the judges to help improve the building and operations. These can also be shared with other property teams. · Competition and recognition can be contagious – other teams will be motivated to achieve the award and standards rise throughout your company’s portfolio. · It effectively becomes an audit of your company’s management services and an opportunity to find improvements. Which Aspects of a Building Are Evaluated? Properties will be evaluated after submitting an application along with an entrance fee of $250.00 (per property address) prior to the on-site inspection in May 2019. All facets of a building's operations are thoroughly evaluated during the on-site building inspection and on-line portfolio judging. The visiting judges, a select group of senior property management professionals, will consider the following areas for judging purposes: Physical aspects include: Entrances/Main Lobby, elevators, multi-tenant corridors, restrooms, stairwells, typical tenant suite, roof, parking facilities (if owner/agent operated), landscape/grounds, refuse removal area and tenant amenities. Other equally weighted aspects include areas as tenant relations programs, community involvement, emergency evacuation procedures, security issues, sustainability programs, preventive maintenance schedules, management policy and procedures manuals including accounting procedures and expense controls, staffing training; continuing education for building personnel. What Types of Documents Are Submitted for Review? Floor plans and photographs complete the regional portfolio, fulfilling an in-depth review of each TOBY entry. Each entry showcases outstanding property teams throughout the Washington area. Office Building Square Footage Categories. NOTE: All buildings with at least 50% office area are eligible. All buildings with at least 50% office area where the building and and building management team preserve and enhance the internal and external environment through green and sustainable programs. Mixed-Use Buildings: All properties will have minimum of 10% Office in a planned integration of at least three components that are a mix of Retail, Entertainment, Residential, Hotel, Recreation or Other Functions. Each component will be at a minimum of 10% of the total property. The property can be one or more buildings managed by the same company. It is pedestrian-oriented and contains elements of a live-work-play environment. It maximizes space usage, has amenities and architectural features that tends to mitigate traffic and sprawl. Public Assembly Buildings: All buildings must be publicly accessible and support multiple uses. The multiple use character of these buildings may influence the building’s utility use, opening hours and tenant or occupant relations. These buildings may be part of a larger portfolio. This category includes: stand-alone arenas, amphitheaters, auditoriums, art galleries, churches, hotels, convention centers, exhibit halls, courthouses, stadiums, university building(s) and other buildings that are publicly accessible. This category allows for entry restrictions based on ticketed or multi-tenant/occupant areas. All buildings, comprising a total project, to include any single building industrial properties, one to two stories in height, with more than 5% and less than 50% office area. Building(s) must have a loading dock, roll-up or sliding rear door(s) for loading, with no common lobby or corridors except for restroom vestibules and utility or fire equipment access. All Building(s) must be at least 15 years old, have maintained a minimum of 50% occupancy (physical occupancy) during the renovation process for all building(s) and 3 or more projects must be completed in each building when submitting multiple buildings. If entry is a single building, a minimum of 5 projects are necessary. Renovation can encompass: (1) Rehabilitation (the restoration of a property to satisfactory condition without changing the plan, form, or style of a structure); (2) Modernization (taking corrective measures to bring a property into conformity with changes in style, whether exterior or interior. It requires replacing parts of the structure or mechanical equipment with modern replacements of the same kind but not including capital additions); and (3) Remodeling (changing the plan, form or style of a structure to correct functional or economic deficiencies). In order to be eligible, a minimum of five of the following work projects must be completed by January 2018 and the building must enter the TOBY program within 5 years following substantial completion of the last renovation projects to be eligible for this category. A group of retail and other commercial establishments, either enclosed or open air, managed by one company. The entry must be managed as a single property, one to multiple levels in height with a minimum of 50 percent occupancy. The anchor ratio must be at least 25 percent and the property must contain at least one anchor retailer (Grocery, Fashion, Department Store, etc.). The entry may consist of neighborhood centers (30,000 – 150,000 sq. ft.), community centers (100,000 – 400,000 sq. ft.), power centers (250,000 – 600,000 sq. ft.), regional shopping centers (400,000 – 800,000 sq. ft.) or super regional shopping centers (800,000 plus sq. ft.). No minimum office area is required. The designated "Winner" attained a score of 75% or higher. Fairview Park, managed by CBRE, Inc.
Watch the TOBY Video to Learn More Information.